This stunning modern house architecture drew its inspiration from an ultra-modern midcentury home, commissioned by American film star Gary Cooper in the early 1950s. Cooper’s home stood in the Hollywood Hills, an outcome of the creative and skilled work of LA architect A. Quincy Jones. A series of sketches and conversations based on the Cooper Residence later, the Moreign Road Residence has been occupying 530 square meters of floor area in the midst of the Australian bush in Attadale since completion in 2013. The home stands beside other homes, yet leading up to the entrance of the residence, a sense of shelter is created by the angular nature of the building. On the one side of the facade, the use of stone and timber evoke a sense of nature while the other angle visually connects the outdoor to indoor with a wall of windows. 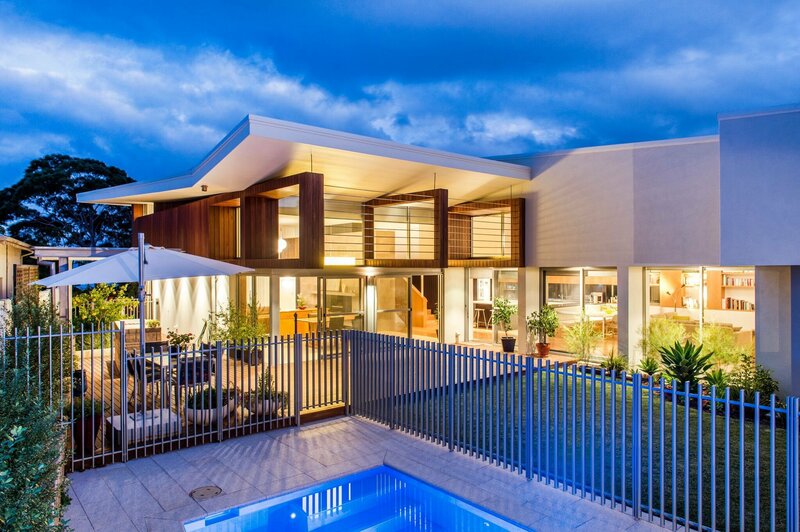 The contemporary home design harbors three main zones: formal, informal and alfresco. A large fireplace entrenched into a wall of stone within a rather formal living room is representative of the first, while the cantilevered mezzanine speaks for a more unofficial space. The area just behind the formal living room is occupied by a dining room, separated by a wooden sideboard. 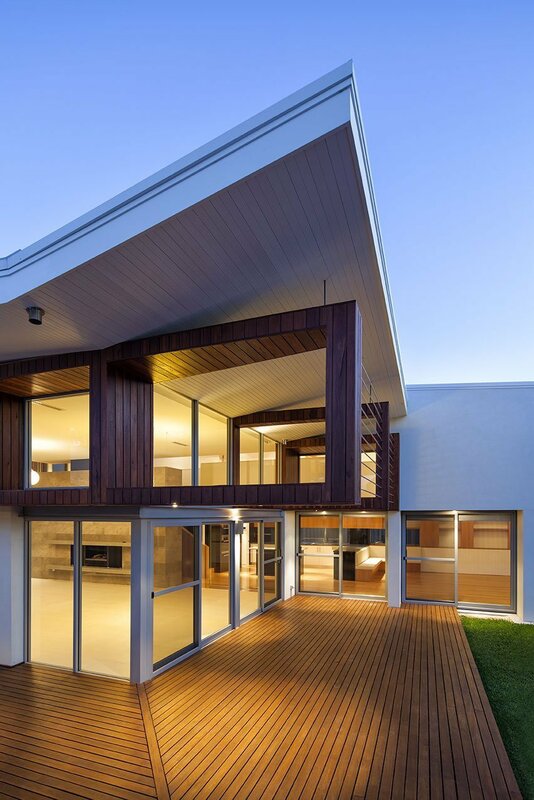 Large windows and a sliding door lead to the backyard and onto a wooden deck that grants access to alfresco dining. An outdoor courtyard entertains a large, wooden patio for lounging and entertaining guests, sided with a fenced off pool area. Stone and wood are very much incorporated to the interior design, bringing nature to the home in addition to visually connecting the three aforementioned zones to one another. 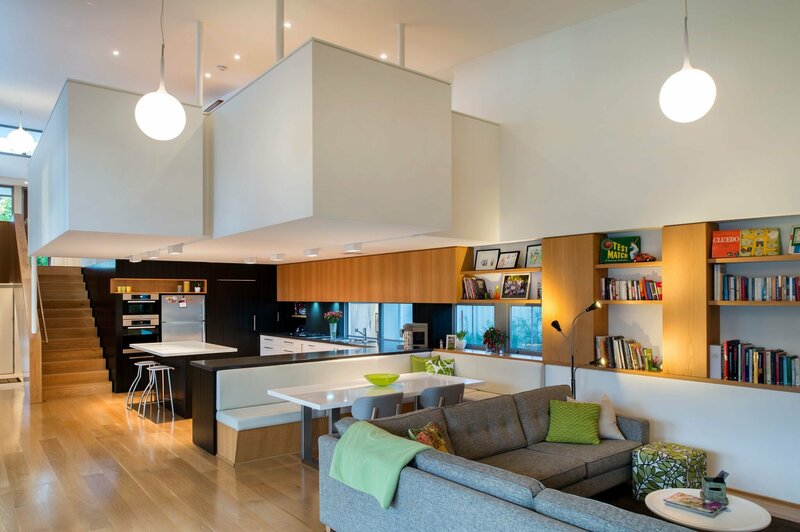 An open plan kitchen is sided with a casual living room. The end of the kitchen has been painted pitch black, giving it an extra modern touch and a beautiful contrast to the wooden floor and cupboards. 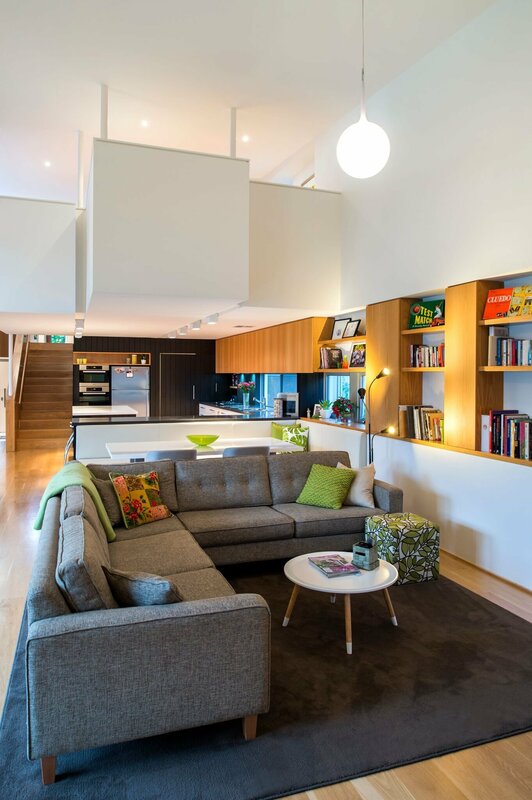 Space is well used and the combination of cosy and modern gives off a refreshing impression. 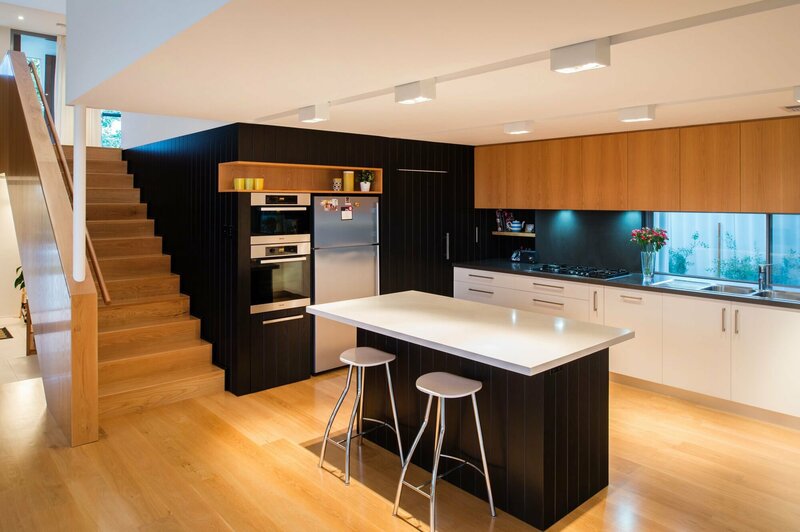 The kitchen’s black accent wall is emerged to wooden stairs which lead to the upper floor of the home. 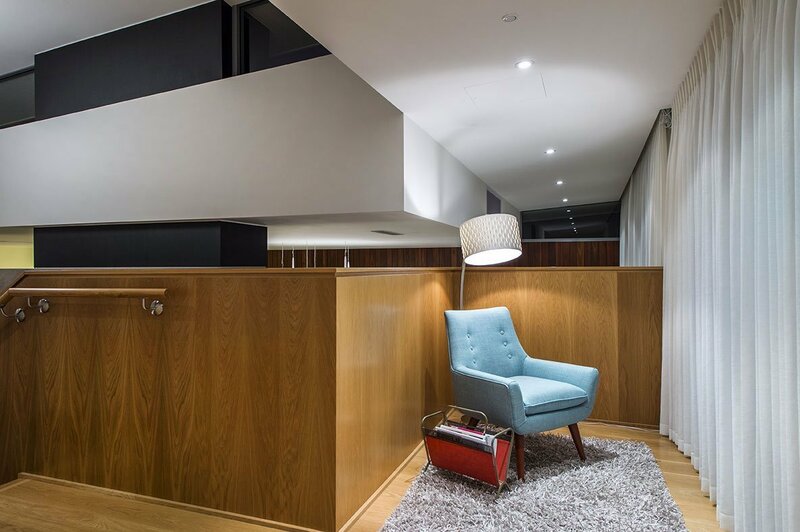 Beautiful wooden paneling leads from the staircase to a cosy corner ideal for reading and relaxing. Here, as in other parts of the house, the modern interior design is kept simple but stylish. 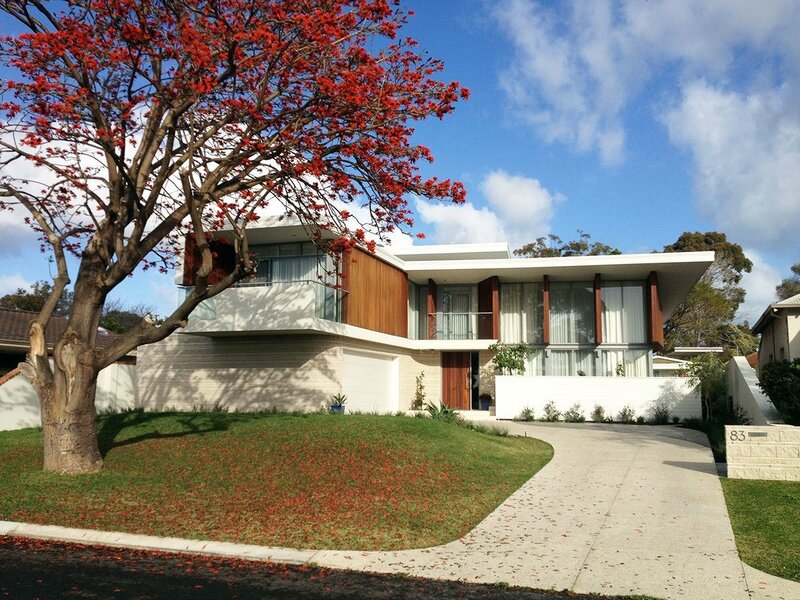 Similarly to Gary Cooper’s home, this Moreing Road residence could have been built earlier or 10 years from now – every aspect of it holds the essence of timeless, midcentury design.